Adam and Hollie first met at a doctor's office in Thousand Oaks, California in November 2009, when Adam was getting treated for Lyme disease and Hollie was his nurse. The pair met for treatments three hours a day, two to three times a week for a year. During those appointments, they talked about everything: Hollie's recent divorce, her love life since the split, her son Joshua from her previous marriage and Adam's father who had ALS. After they were done with treatments for the day, Adam would head back to work, where he'd often send Hollie emails saying that their time together was the best part of his day. Although Adam was initially treated for Lyme disease, he was later diagnosed with amyotrophic lateral sclerosis (ALS), the neurodegenerative disease behind all of those Ice Bucket Challenges. After receiving the diagnosis, Adam told Hollie, "I want my last days seeing your face, kissing your lips, sleeping by your side. I understand if you don’t want this burden on you. But if you want me, I want to marry you," as she recently explained to Style Me Pretty. Without hesitation, Hollie agreed to be his wife and to love him and take care of him. The pair got engaged in October 2011. 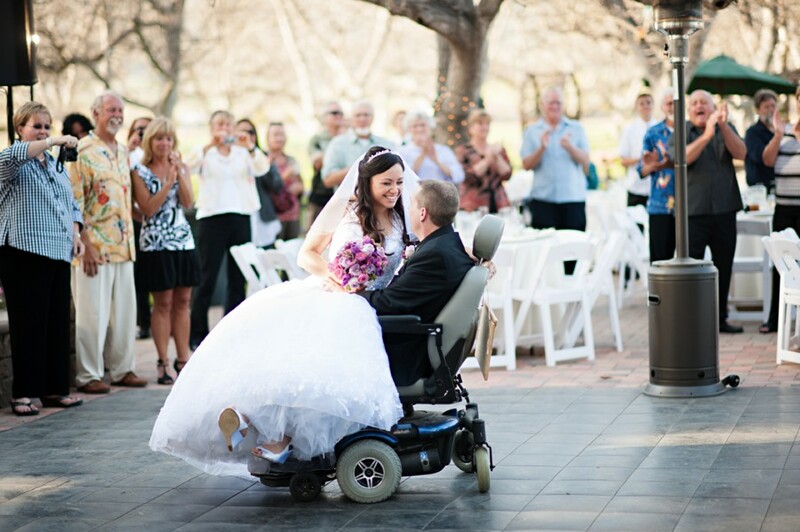 They needed a wedding venue that was wheelchair accessible to make things easier on Adam, so the clear pathways at Walnut Grove At Tierra Rejada Ranch in Moorpark, California made it a perfect choice for the pair's spring 2012 nuptials. They even managed to do a first dance at the reception. Hollie sat on Adam's lap with her hand wrapped around the headrest of the wheelchair as they moved in circles to The Beatles' "In My Life." 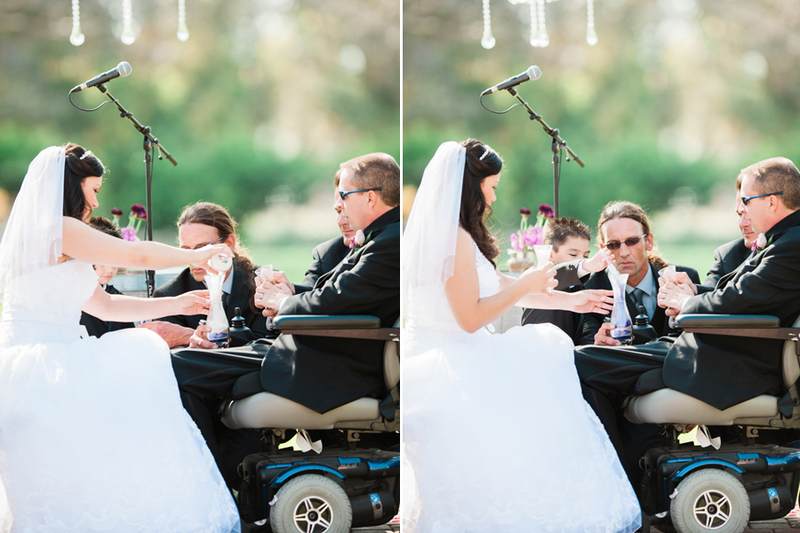 Hollie told The Huffingon Post that her favorite memory from that day was during the ceremony when she, Joshua and Adam each poured a different color of sand into a single container to symbolize the union and their coming together as a family. “As these two containers of sand are poured into the third container," the officiant said, "The individual containers of sand will no longer exist, but will be joined together as one. Just as these grains of sand can never be separated and poured again into the individual containers, so will your marriage be, united as one for all of your days." After the wedding, Adam legally adopted Joshua as his son. "Joshua loves Adam, he calls him his dad and he is all he knows," Hollie told The Huffington Post via email. "He knew his dad was sick and there was no medicine for his sickness." Sadly, their time as a family was cut short when Adam died in October 2013. "One of the many things that helped me get through all of this -- watching him waste away and not being able to do anything about it -- was when he said to me, 'Only the good die young… I love you and I’ll see you again,'" Hollie said. Check out more photos from Hollie and Adam's beautiful wedding day below.